For the past couple weeks in my "On History" spot, I've been posting some comic book scripts that I had found floating around in my archives. This week, I've got Steve Englehart's original script for Fantastic Four: Big Town #1 (cover dated December 2000). 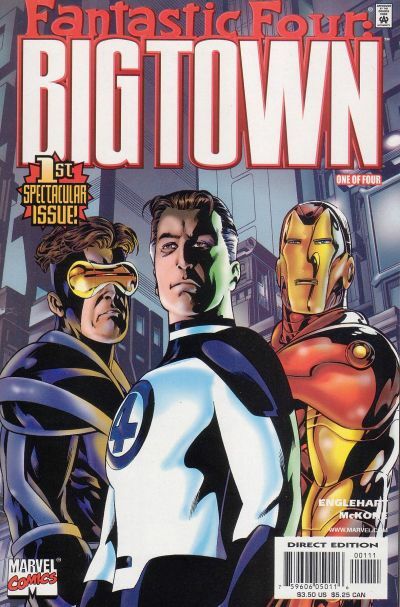 The basic plot was: what if Reed Richards' and Tony Stark's inventions were given actual social ramifications? Like, if "unstable molecules" were really a thing, how would that impact society beyond just being stretchy fabric for superheroes. The finished product wasn't bad, I didn't think, but certainly not as good as it could have been. Possibly explaining why it's never been collected or reprinted. In any event, here's Englehart's original script to issue #1 with red highlights noting the portions that were changed. Under the circumstances, Marvel could have at least had the courtesy to credit the series to John Harkness.